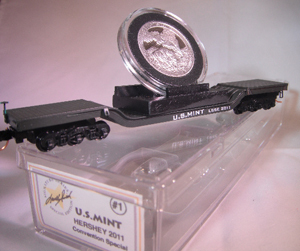 This Micro-Trains flat car has a custom cradle and is carrying a US Mint “Proof” quarter of the new “America the Beautiful” coin series. While this car is a typical custom hand made Concept Car, Micro-Trains will be commissioned to produce the rest of this series. One per year for the next ten years. Just wanted to thank you again for the opportunity to be with you and the many other happy folks who experienced the Feather River Canyon trip. I know you put a lot of work into making this special trip a reality and it all came together extremely well! Thanks, Lowell, for another awesome addition to an already incredible train.